In the light of Turkey’s crucial role in NATO’s five-year-long genocidal covert war on Syria, it truly beggars belief that only five weeks before the launch of this war in March 2011, Turkey’s then Prime Minister Recep Tayyip Erdogan (now President) was still fully engaged in ensnaring Syria’s President Bashar al-Assad with an utterly treacherous “friendship” discourse. In fact, 4 months after a foundation stone laying ceremony of a “friendship dam” held at the border between Turkey’s Hatay province and Syria’s Idlib province; the same border area was used by NATO’s mercenary-terrorists to perpetrate their first large-scale massacre in Syria. Turkey and Syria laid the foundation stone of the ‘Friendship Dam’. Further steps which will transform the border [between Turkey and Syria] into a nominal one are due to follow… caption: Messages of fraternity: Thousands of Turkish and Syrian people took part in the foundation stone laying ceremony in Hatay [province]. [Turkey’s] Prime Minister Erdogan and Syria’s Prime Minister Otri (whom Erdogan calls “my precious friend”) waved to the crowds by holding each other’s hands. Both prime ministers stated that the exemplary friendship and cooperation between their countries will continue by reinforcing further. sidebar: The agenda in Aleppo is the flame of rebellion After the foundation stone laying ceremony, [Turkey’s] Prime Minister Erdogan went to Aleppo to meet Syria’s leader Bashar Assad. The two leaders discussed the developments in Egypt and Lebanon and pointed out that they will be undertaking joint efforts to meet the demands of the people of Egypt and to restore stability to Lebanon. sub-headline: A report by NATO [Defense] College and an analysis in the New York Times both came up with the same conclusion: ‘Turkey should serve as a role model for Egypt’. sidebar: ‘Lessons must be drawn from what is being experienced [in Egypt]’ Yesterday, [Turkey’s] Prime Minister Erdogan met with Syria’s leader Assad in Aleppo. At the meeting where the developments in Egypt were discussed, Erdogan told Assad “Lessons must be drawn from what is being experienced [in Egypt]”. Assad, in turn, stated that they will expand the reforms [in Syria]. caption (smaller photo at the bottom): An agreement “to undertake joint efforts to meet the expectations of the people of Egypt” was reached during Erdogan’s meeting with Assad at the presidential palace [in Aleppo]. 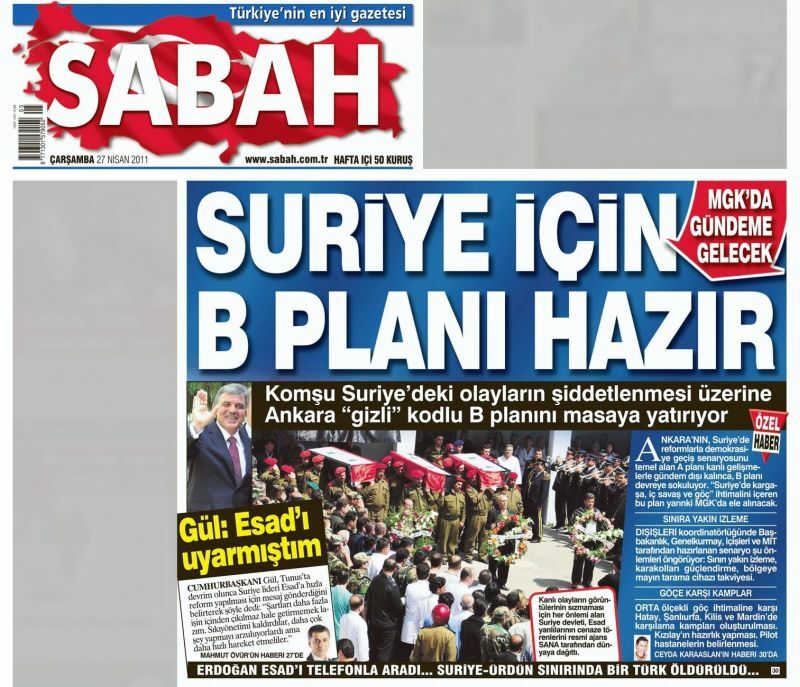 [hyperlinks and emphasis added] editorial note: With hindsight, this front page is highly revealing of the real agenda behind Turkey’s “friendship without borders” discourse. 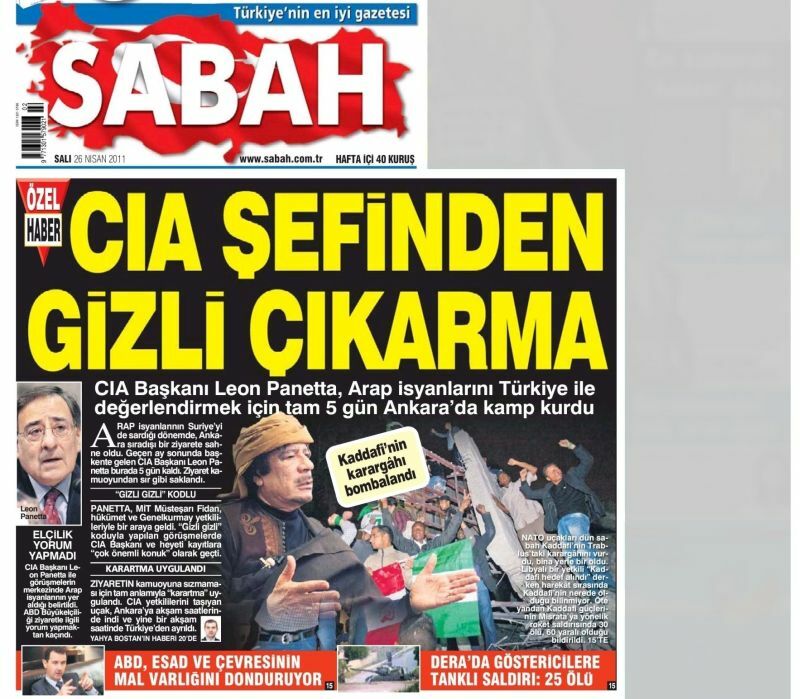 sub-headline: In order to evaluate the Arab revolts with Turkey, CIA Director General Leon Panetta has spent five full days in Ankara. Sabah obtained important details of highly critical consultations held in Ankara at a time when Arab revolts [sic] engulfed Syria as well. The Director of U.S. ‘Central Intelligence Agency’ (CIA) Leon Panetta paid a surprise visit to Ankara at the end of March . (*) Panetta’s five-day-long visit to Ankara was kept secret from the public opinion. […] Apart from the Director of MIT [i.e. Turkey’s ‘National Intelligence Directorate’] Hakan Fidan Panetta held consultations with the officials from the Government and from the General Staff [of Turkish Armed Forces]. […] [At the meeting], it was concluded that Syria is “at a critical threshold” […] [and] unless Assad takes urgent steps, the country will rapidly fall into civil chaos. Details of what Turkey designates as a “classified” [plan] about Syria were also discussed. It was pointed out that the “classified” [plan] consists of a regime change in Syria and of ensuring life safety of the Assad family. (*) NATO’s covert war on Syria was launched on March 15th, 2011.
sub-headline: In the face of the escalation of violence in the neighbouring Syria, Ankara elaborates its “classified” Plan B.